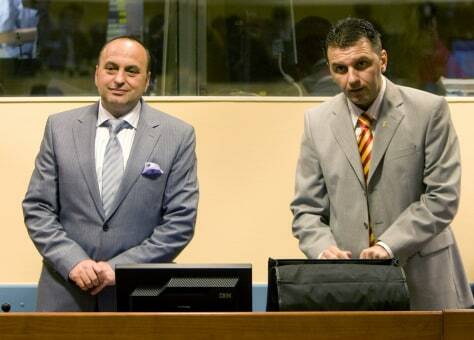 Macedonia's former interior minister Ljube Boskovski, left, and former police officer Johan Tarculovsky, right, arrive at the courtroom of the Yugoslav war crimes tribunal in The Hague, Netherlands, Thursday, July 10, 2008. A U.N. tribunal has acquitted Macedonia's former interior minister of murder, cruel treatment and other war crimes stemming from a 2001 attack by police on an ethnic Albanian village that left seven men dead. However, a police officer who led the attack was convicted and sentenced to 12 years in prison.